Georgy Shenderyov. 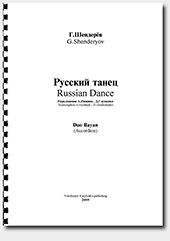 Russian Dance from "Russian Suite"
Georgy Shenderyov. Russian Dance from "Russian Suite" - (available for Accordion SOLO here). Video demo: Georgy Shenderyov. Russian Dance (from "Russian Suite").